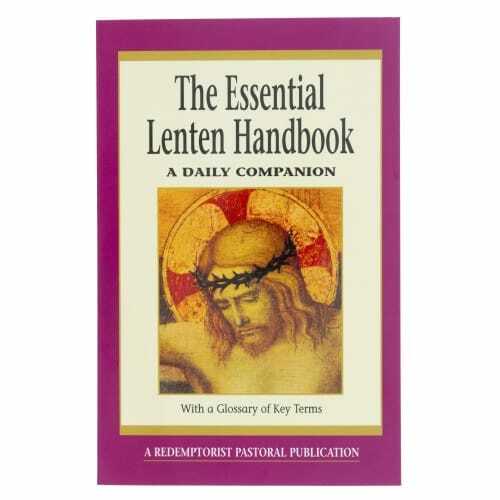 The Essential Lenten Handbook provides everything readers need for a richer experience of the forty days before Easter. Whether one wishes to follow a traditional program of Lenten devotions centered around prayer, a "modern" program that focuses on Scripture readings, a family model that brings loved ones together for a shared spiritual journey, or a unique devotional program, this all-in-one resource is an invaluable reference and the quintessential compact guidebook to all of the basic Lenten practices of Catholicism. Perfect for Catholic families, returnees in need of a refresher course, converts learning about the Catholic faith, seekers looking to recharge their lives, and people who are searching for a helping hand through the Lenten season. This book is amazing! I have never been able to understand the way of lent, which is why I never made it special. But after going over this book, I decided to purchase it. I made a great choice by buying this book. It has helped me understand the true meaning of what it means to walk with God during lent. I really love this! Wonderful, easy to understand guide. THE BOOK TOOK ME AWHILE TO FIGURE OUT HOW TO READ IT, BUT IT IS A HELPFUL GUIDE FOR LENT, BUT I DO READ IT EVERYDAY AND IT ENCOURAGES ME WITH THE UNDERSTANDING OF WHAT LENT IS. I added this to my library and will utilize it more next year but great book! I love this book! It's got everything. I'm having one of the best Lents I've had in years. Can't wait to buy the Advent Handbook. This is exactly what I needed for spiritual guidance over Lent. I would definitely recommend this book to a friend. I really appreciate that the book is very flexible in the sense that readers can choose what to do/read each day, and each day of the week. It has wonderful prayers, and deep yet simple reflections and guidance for meditations. I love this book. It is easy to read and very informative. Every thing you need to know about Lent in this book. My husband recently became a Catholic and he finds this book very useful. This was for me a good find as I am always searching for readings to help me through Lent. In past years I have felt that something was missing, I was not doing enough; but this handbook inspires me in my meditations, my prayers. I am very happy to have found it and I think that every practicing catholic should have a copy. What a wonderful resource to aid in my Lenten journey! I gave a copy to the RCIA candidate I'm blessed to sponsor and she's enjoying it too. I have even recommended this book be given as a resource for upcoming RCIA sessions. I love it!!!! a great help during Lent. I like the variety of ways to use this Lenten handbook. This handbook was conceived with that end in mind and gives explanation of different prayerful avenues in which to enrich your lenten spiritual journey. Prayers contained therein.....some modern and some old.....good resource. The above should explain it fully...Essential! Great for all in your family! Bought as a gift for my daughter. she loves it and this gem has her looking at Lent in a new way. Very good book; worth the purchase!! A wonderful book to have for Lent!